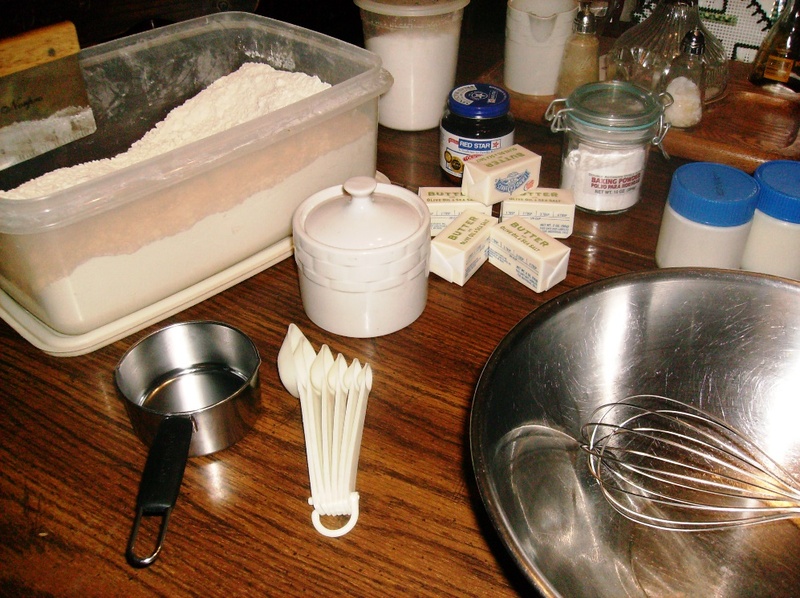 Mix dry ingredients in large bowl with a whisk. 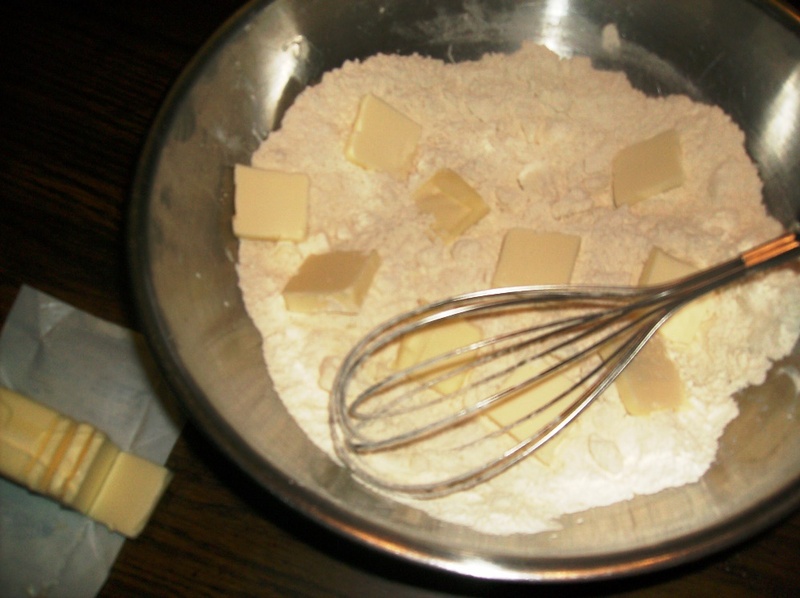 Cut cold butter pieces into flour mixture with a pastry cutter or fork until crumbly. Add liquid and mix (it will look un-cohesive at this point). 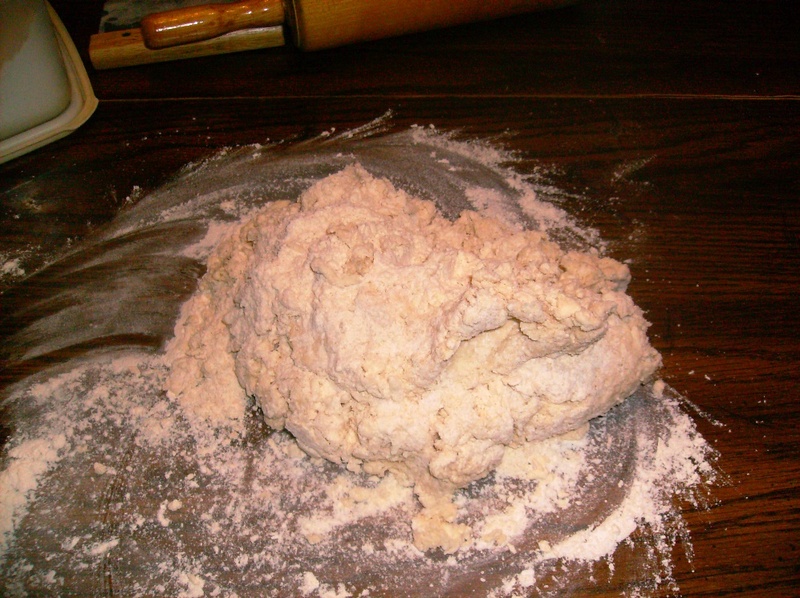 Turn out onto floured surface and knead until dough comes together but don’t overwork it or you will lose the flakiness. 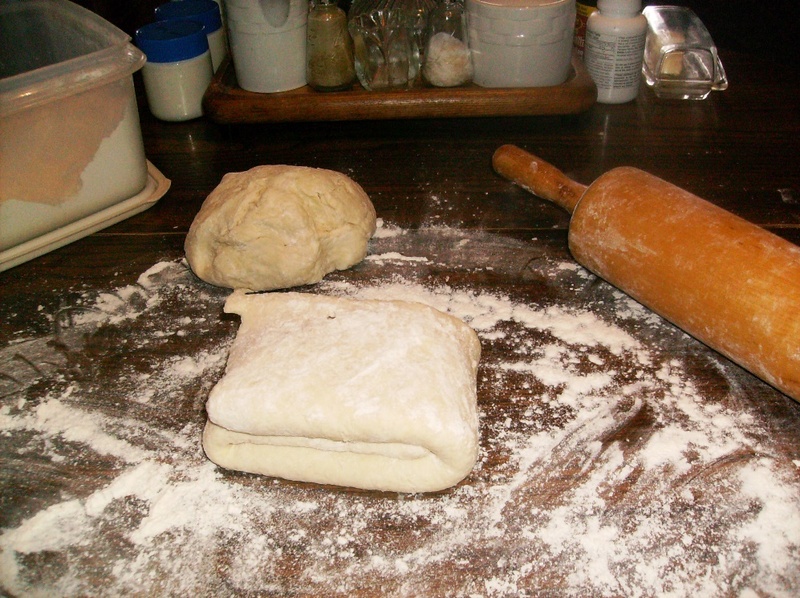 Divide the dough in half and form each half into a rectangle. **Roll the rectangle out to approx. 8” x 10”. Fold rectangle in thirds and then in half the opposite way. Roll it out again and fold it again. 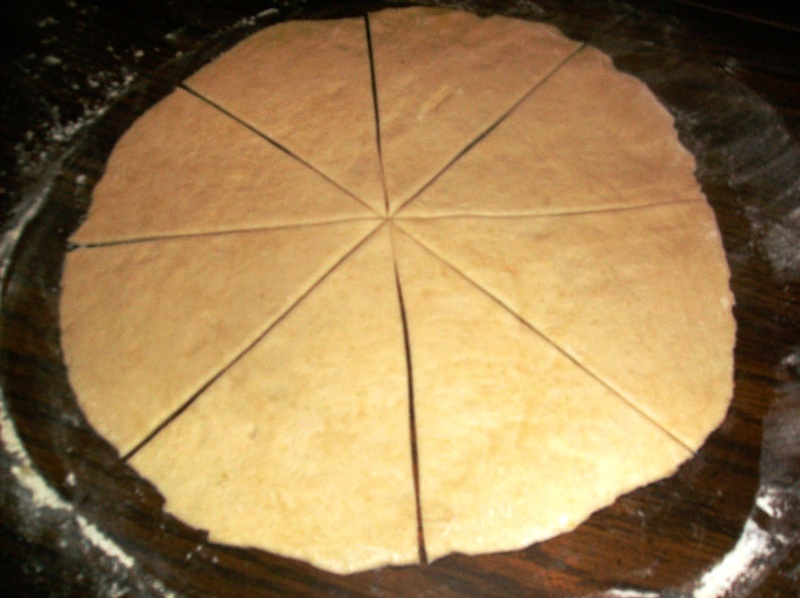 Cut the dough in half and shape into a round disk. Wrap in plastic and put in the fridge for at least 2 hours (overnight is best). Repeat with the remaining dough from **.You should have 4 dough disks when you are finished. These can be frozen for up to a month if you like. 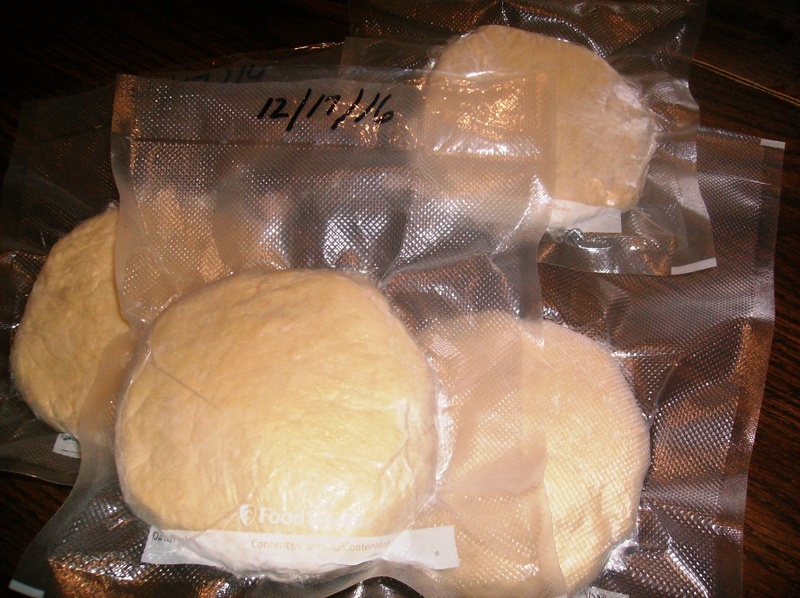 When you are ready to make the rolls remove the dough disk from the fridge or freezer and allow to come to room temp. 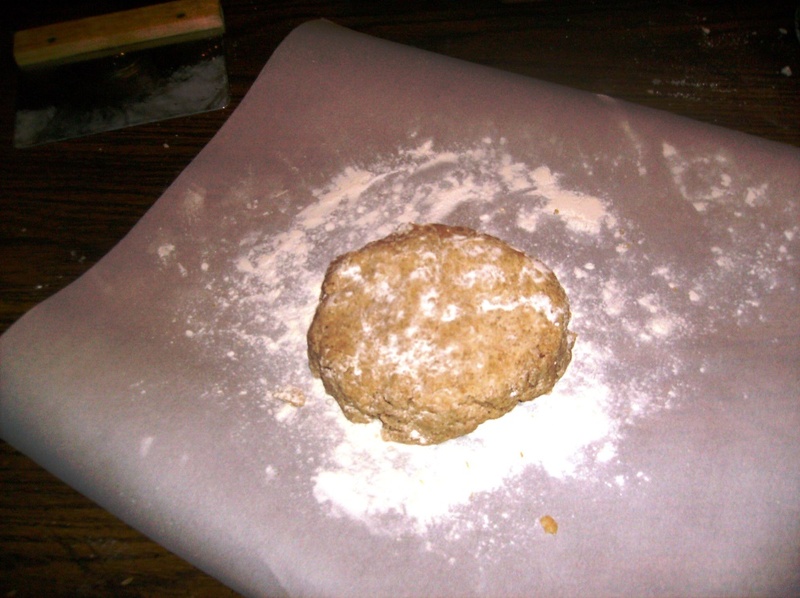 Put on a lightly floured surface and roll disk into a 10 – 12 inch circle. Cut into 8 equal wedges (I used a pizza wheel to do this). 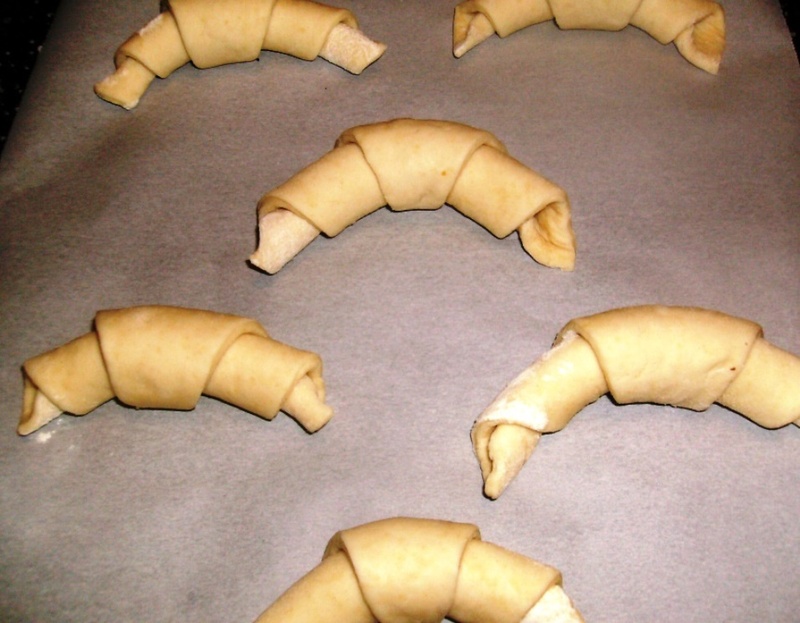 Roll each wedge into a crescent and put on a parchment lined or lightly greased baking sheet. Cover and let rest for 3-4 hours depending on the temp of your home. Preheat oven to 375 degrees. Bake for 25 minutes. Brush with melted butter. Serve warm. Mmmmmm Mmmm Good. NOTE: Each rolled disk section of dough makes 8 rolls. 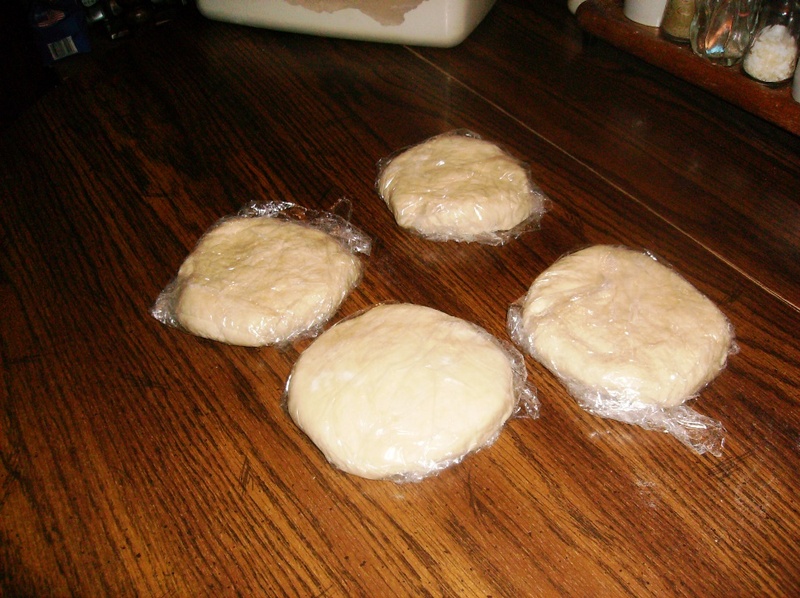 Wrap some dough up in plastic wrap and store in the freezer for later use. I pre-freeze mine in plastic wrap then vacuum seal them to store in the freezer for longer periods and to insure freshness. I’m new to sprouting grain but became interested after reading about the health benefits. Since I started experimenting with malting for making my home brewed beer sprouting grain just seemed like an extension. I looked through my pantry and found a bag of organic quinoa and thought “Why Not!” So I sprouted the quinoa, then dried it in my dehydrator and then ground it into flour. 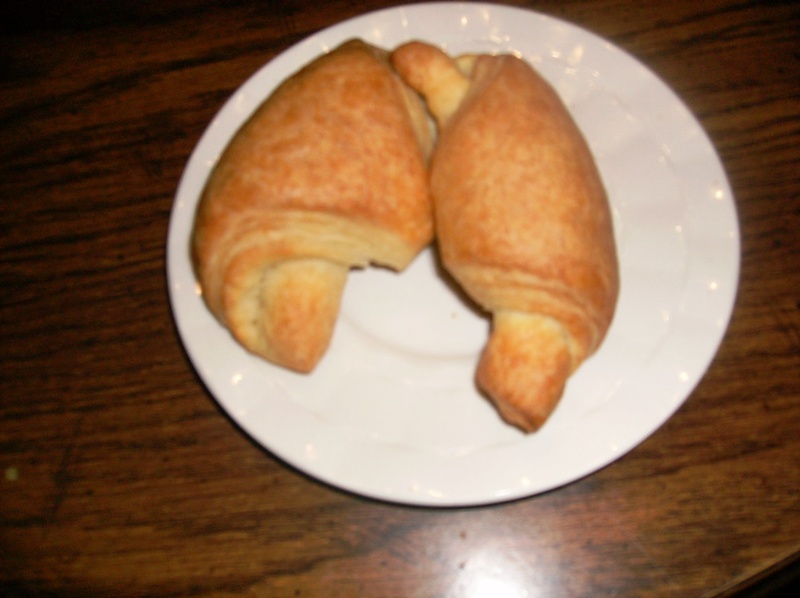 The flour had a wonderful buttery nutty aroma that sent thoughts of wonderful possibilities running through my mind. I decided to make it into a pie crust. It turned out so light and flakey and flavorful that it could stand alone without any filling at all. BUT fill it I did. 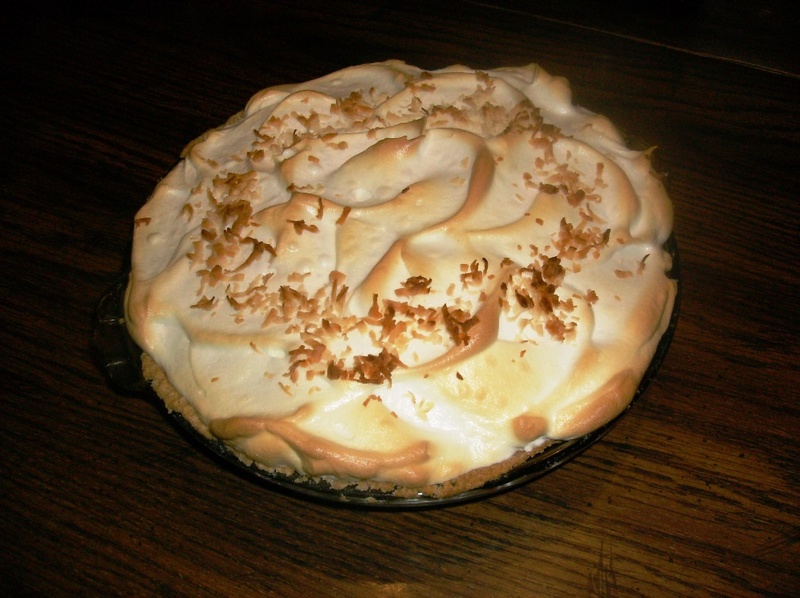 I paired it with a creamy coconut milk filling topped with a light fluffy meringue. Mmmmm delish. Another Happy Accident!!! First of all I chilled all of my bowls and utensils prior to starting my crust preparation. Sift together all dry ingredients then cut in coconut oil with a pastry cutter or fork until crumbly. Add the apple cider vinegar to the cold water. 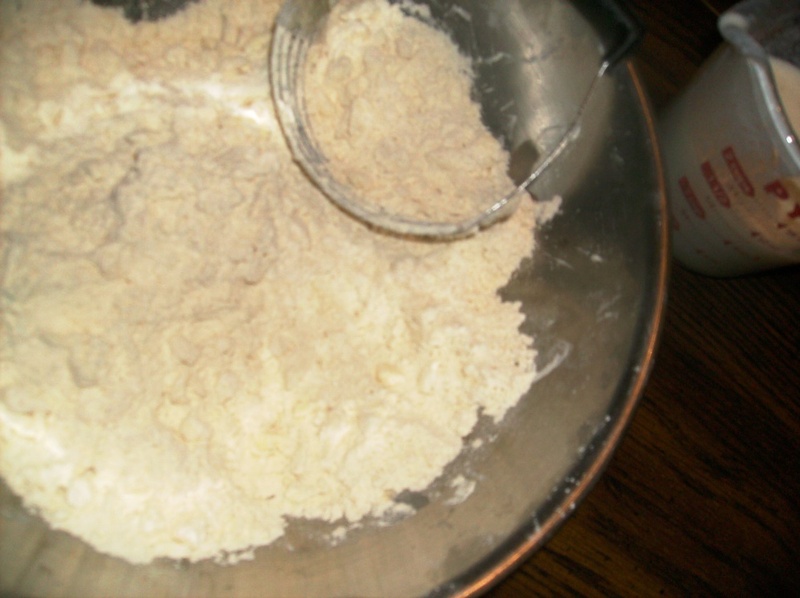 Mix the cold water gradually into the flour mix until it forms a ball. Roll out dough on parchment paper to form desired size circle keeping rolling pin well floured.. Gently use parchment to fold crust over. Be careful as dough is delicate. Transfer crust to pie plate and unfold and trim edges. Bake at 350 degrees F. for 15 minutes. Remove from oven and cool. 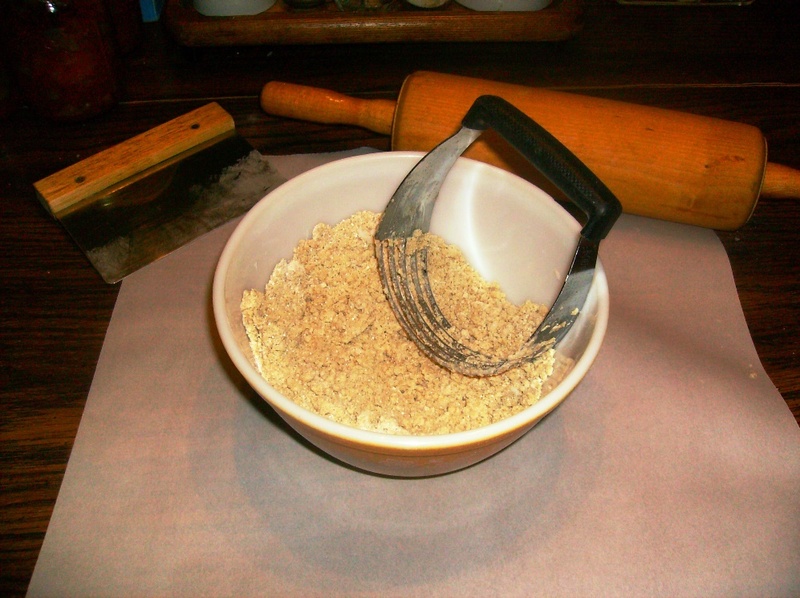 Makes 1 – 9 inch deep dish pie crust. Combine the flour and sugar in a medium sauce pan. Mix well to prevent lumps when adding liquid. Add the milk, coconut milk, coconut extract and butter. Cook over medium heat stirring constantly until mixture starts to thicken. Add some of the thickening mixture to the beaten egg yolks and whisk then add back to the pudding and mix well. Add shredded coconut and continue to cook until thick. Pour filling into crust and place waxed paper over filling so it doesn’t form a film as it cools. Prepare meringue. Whip organic egg whites and cream of tartar until soft peaks form. Add sugar 1 tablespoon at a time until stiff peaks form. Spread meringue over pie filling and sprinkle with shredded coconut. Bake pie at 300 degrees F for 20-30 minutes to set and brown meringue. Remove from oven and cool completely. NOTE: My crust slid down the sides of the pie plate in a couple of spots when I pre-baked it so I will use parchment and pie weights (I use dried beans) the next time so it will be prettier. After learning about making yeast from readynutrition.com Survival Food Series: 3 Ways To Naturally Make Yeast I decided to try it out and see if I could make wine without purchasing wine yeast. I’ve made wine and beer for many years but have always purchased the little packets of yeast. When I let nature take care of this process for me the fermentation process took longer to start (11 days verses 1 day) but the overall flavor was more true to the fruit that I used and it was crisp and clear. In large sauce pan dissolve sugar in 1 quart of water. Let cool to room temperature. 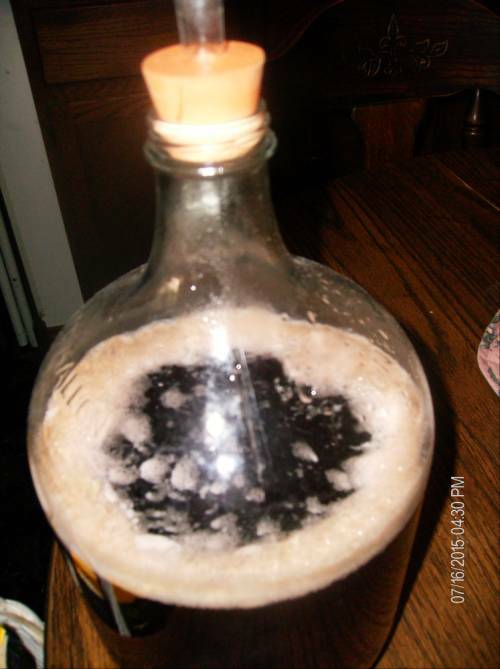 Combine all ingredients in a 1 gallon sterile glass carboy and put airlock in place. Fermentation will start in 1 to 2 weeks. Leave ferment in a cool place out of direct sunlight until bubbling stops. 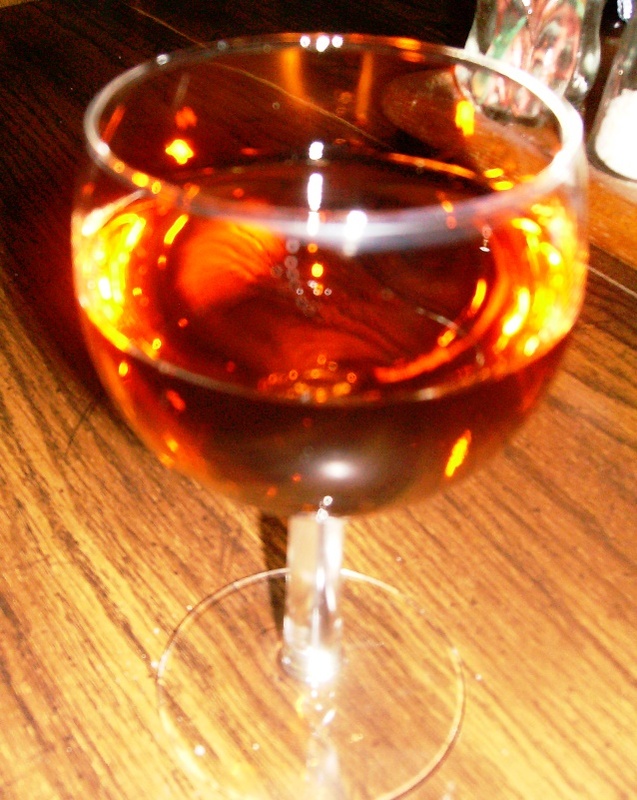 Siphon off the cleared wine into sterile dark wine bottles and insert cork stoppers. Enjoy! Here is one of my favorite quote to start your day! !